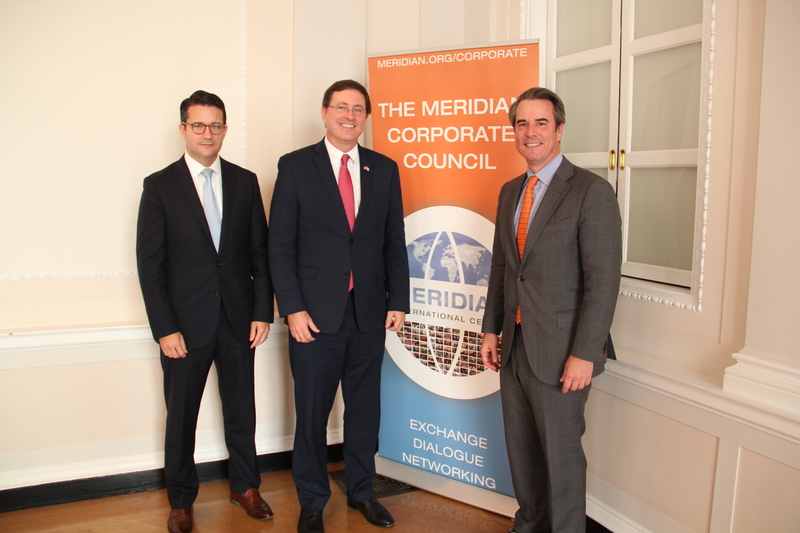 Meridian held an installment of the Global Business@Meridian breakfast series on October 24th, 2017. Hosted by Mr. Jason Grove, Senior Director of Global Government Affairs and Policy at Abbott Laboratories, the program featured Ambassador of Costa Rica, Roman Macaya and drew over 15 corporate leaders together to engage in an off-the-record dialogue on economic challenges and opportunities in Costa Rica. Following around-the-table guest introductions facilitated by Ambassador Stuart Holliday, Mr. Grove highlighted the longstanding relationship between Ambassador Macaya and the Embassy of Costa Rica and the United States. He introduced the Ambassador by remarking on his incredible career and diverse background based in science and now diplomacy. Following Mr. Grove’s introduction, Ambassador Macaya began by remarking on how the economy of Costa Rica has changed from one that was largely based in agriculture to one that is made up largely of services and highly regulated products such as life sciences, food industry, manufacturing, and shared services. He emphasized the opportunity for Foreign Direct Invesment in Costa Rica and as a way to cover the current trade deficit. 3 Things to Know About Costa Rica: Ambassador Macaya enumerated 5 aspects of Costa Rican economy that he thought were important for the group. 1) The U.S. has and has had a strong presence in Costa Rica which has been successful and is expanding; 2) The labor market in Costa Rica is highly specialized and highly productive; and 3) There are significant benefits to investors in the country due to the tax structure. Opportunities for American Business: Expanding on Ambassador Macaya’s introduction, he emphasized the untapped potential of human talent in Costa Rica as they are ranked Number 1 in education in Latin America and the Number 8 location for U.S. students to study abroad. As a result of this robust education, STEM jobs and fields have expanded in Costa Rica. In addition, unlike other countries, foreign countries are seen as a benefit to Costa Rica’s economy and are a welcomed addition. In addition, Costa Rica has a high level of tourism and is focusing on ways to maintain sustainable development, eco-friendly tourism, and ways towards renewable energy sources. There are several opportunities for collaboration between American and Costa Rican businesses. Meridian looks forward to working with the Embassy of Costa Rica on future initiatives in Washington.